Communauto subscribers travelling to France can use vehicles from Communauto Paris, our Parisian branch. There is no extra cost. You also benefit from the same package and deductible as the one you have with Communauto. 2. A Communauto Paris employee will contact you to complete your registration. 3. Choose to receive your registration package by mail (within 2 weeks) or to pick it up at our office located in Paris’s eleventh arrondissement. A courtesy invoice will be sent by Communauto Paris if you use a vehicle. However the amount will be put on your Communauto invoice (the exchange rate will be calculated on the billing date), so you will only have one bill to pay. Bon voyage! 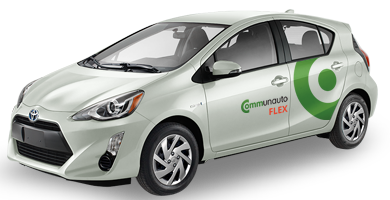 Communauto subscribers travelling to Nova Scotia can use vehicles from CarShare Atlantic. There is no extra cost. You also benefit from the same package and deductible as the one you have with Communauto. To be able to reserve a vehicle in Halifax, simply register on the CarShare Atlantic website (select “I want to start my registration”) and follow the instructions (you will be asked to provide your SAAQ driving record dating back less than 6 months). An invoice will be sent by CarShare Atlantic. You will need to pay the amount to CarShare Atlantic, not Communauto. Bon voyage ! You are about to reserve a vehicle from Vrtucar, our partner that services Ottawa. Vrtucar is a separate business that operates independently of Communauto. Although we offer equivalencies for the packages, Vrtucar rates are different than those offered by Communauto (except for the Train+Auto rate) and the rules and regulations are not identical. If you decide to use a Vrtucar vehicle, it is your responsibility to inform yourself of and to follow their rules and regulations by consulting the Vrtucar website and reading the applicable Membership or Driver Agreement. To learn more, watch Vrtucar's orientation webisodes. Don't forget your RFID key, as all Vrtucar vehicles are equipped with this technology. 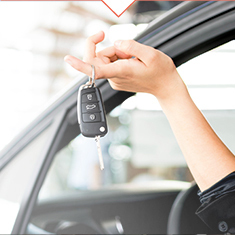 As well, unlike Communauto, the Vrtucar car keys are located inside their vehicles. Your RFID key will allow you to open the doors of the vehicle to access the key. Please click here to learn about the corresponding packages of Vrtucar and Communauto. A separate bill will be sent to you for these trips. Unlike Communauto, Vrtucar accepts credit card payments. Please contact Vrtucar in order to take advantage of this option. You must accept conditions to continue. More than a thousand vehicles at your disposal ! Communauto’s station-based vehicles are available upon reservation and are brought back to their original station at the end of each trip. The ability to book these vehicles in advance and knowing exactly where they are when it is time to take possession, provides the reliability required for your important or frequent trips. This service’s rate structure is extremely competitive if compared to any other type of offer. Access a vehicle for as little as $2.35/h or $19.80/day. Mileage fees are extra. Take it and leave it wherever you want ! Auto-mobile vehicles are available on the street 24 hours a day. They do not need to be reserved before use but can be « blocked » to give you the time needed to get to the vehicle. You can use an Auto-mobile and leave it anywhere at the end of your trip, where no restrictions apply, within the service area*. It’s so easy! Access a vehicle for as little as 40¢/minute, $12/h or $50/day. 100 km included per trip, 20¢ per extra km. Preferred rates available to people enrolled in one of the FULL Communauto subscription packages. Auto-mobile’s basic subscription does not give you access to Communauto’s station-based vehicles. However, if you subscribe to Auto-mobile, it will be possible, at anytime, to modify your subscription in order to access our entire offer. * Auto-mobile is only available in Quebec City and Montreal for the moment. 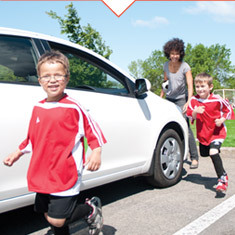 Communauto subscribers have access to Halifax cars from our sister company CarShare Atlantic. See CarShare Atlantic website to know prices and conditions in this town. Communauto subscribers have access to Paris cars from our subsidiary. See Communauto.paris website to know prices and conditions in this town. To reserve a car, download the app, use our web app or log in your online account. Auto-mobile now in Quebec City! Discover Communauto's free-floating, reservations free carsharing service, the ideal solution for your spontaneous trips. It is economical, convenient, ecological and commitment-free. 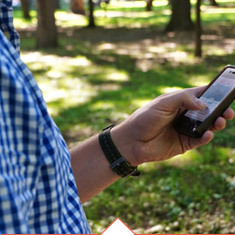 Book your car on your smartphone! More than a thousand vehicles that you can book in one of our parking spaces near you. Several hundred electric and hybrid vehicles which you can use without a reservation to go from point A to point B. More than fifty cars electric and hybrid vehicles which you can use without a reservation to go from point A to point B. With this exceptional offer, enjoy unlimited Auto-mobile trips of 30 minutes or less for a whole month. Being a Communauto user also means being part of a community that gives you access to many perks and allows you to stay informed of news on the service as well as what's going on in the world of sustainable mobility. Save an average of $425 by bundling you home, car or leisure vehicle insurance with La Capitale. I can reserve anytime, anywhere, thanks to the mobile app. Not only do we use a car only when we need one but we are also helping the environment. March 6th, 2018 / 1 in 5 Torontonians would consider replacing their vehicle with a carsharing service!